It's been another great year in wearable tech, but that's not to say all the cutting innovation and exciting new products came from the industry's biggest hitters. There's plenty of startups rolling the dice on crowdfunding platforms and looking to turn their idea into a reality. But even if the right amount of backers are willing to invest in a project, delivering a product and meeting expectations is a totally different ball game. This year, we've spoken to countless companies with lofty ambitions through our weekly Crowdfund this series, and below we've caught up with some of our favourites in order to see just where things are at with the campaign, how the post-funding process has been and what plans they hold for 2018. We caught up with the folks at Embr Labs back in October, as their solution for regulating body temperature from the wrist was on its way to raising a whopping $629,856 on Kickstarter. Since the campaign closed later that month, co-founder Sam Shames indicates the startup — which was born at MIT back in 2013 — has been busy ramping up production in order to deliver units. "In the last three weeks, we've shipped out more than 250 units and are on pace to deliver to all our Extra-Early Bird backers by February as promised. The feedback from customers for the first 250 units as been really promising and helped us understand what features people love and what bugs we still need to work out," he told us. But after such a successful 2017, what does Embr Labs have in store for next year? Well, fulfilling the orders is naturally the priority right now, but it will also be aiming to transition from that phase and continue to spread the word about Embr Wave. While the likes of Apple, Fitbit and Samsung are all on a quest to create the most feature-rich experience from the wrist, Finnish company Haikara launched their campaign with the hope of scaling back smartwatches in favour of sleek design. And after managing to raise over $150,000 in pre-orders through Indiegogo, the company has since received more funding from private investors. However, in order to deliver the kind of experience it promised through its campaign, Haikara's Davey Blinov indicates that the rollout of orders will be slightly delayed. "Component sourcing was one of the toughest parts of the project, which took us a few months longer than expected to complete," he told us. "From the very beginning we've set ambitious targets for the thinness, battery life and other components of Haikara. Rushing to deliver by December would mean compromising the quality people are expecting from Haikara. Therefore, the new target delivery date is March 2018." Haikara's team of 25, which is based in Helsinki, is on track to deliver upon the five-day battery life, and, as Blinov says, beat the company's thinness expectations — with each variation of the Haikara smartwatch clocking in at under 9.5mm. 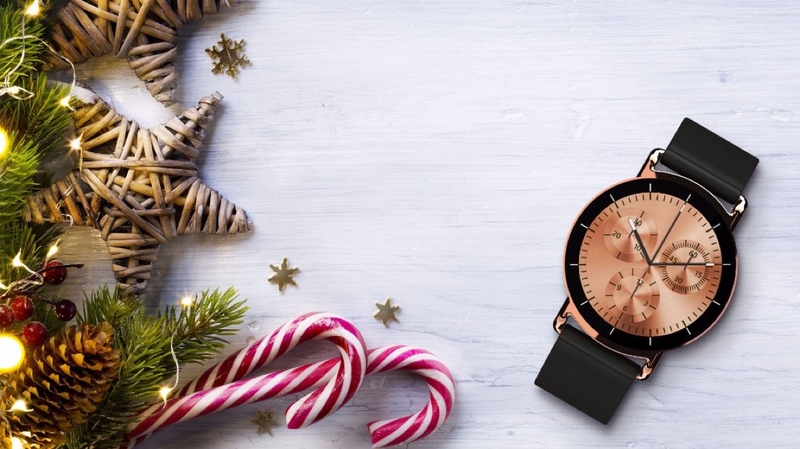 Before the MyKronoz ZeTime rolled onto crowdfunding platforms earlier this year, those looking for a smartwatch had to pick between a hybrid option or a device with a full touchscreen. But by designing a watch that could provide both mechanical hand movement and a touchscreen, MyKronoz went on to post one of the most successful campaigns of all time. With $5,333,792 raised on Kickstarter and a further $6,464,445 on Indiegogo, MyKronoz has been busy fulfilling its first batch of orders to thousands of backers. However, after this first wave took some time to complete, the company is now looking to speed up the rest of its remaining shipments over the coming weeks. The focus will then turn to the ZeTime 2 in 2018. We had our first look at the MyKronoz ZeTime at IFA back in September, but we'll be putting it through its paces in the new year to see if it holds up against the heavyweights of the industry. After all, the recently released Garmin Vivomove HR is already offering something similar. The London-based company which won our Startup of the Year Award at the Wareable Tech Awards 2017 in November, Circadia is looking to leave the first generation of sleep tracking behind with its self-described "sleep aid". Raising an impressive $203,099 on Kickstarter earlier this year, Circadia uses a contactless sleep system featuring a sleep tracker, therapy lamp and mobile app to help you fall asleep faster and boost your energy. We've tried out a beta version of the device and were impressed with the results, and Circadia has hinted it's on track to deliver shipments on time next year. And if you missed out on this project earlier this year, you can pre-order ahead of an expected delivery in July 2018 over on the Circadia website. While many wearable pods are out there providing insights to runners, Danish startup Shft this year looked to take this a step further by using the data captured to bring AI coaching in real time. Headed by former Danish national cycling team member Tony Motzfeldt, the team at Shft debuted the Shft IQ, a pod that went on to raise $59,627 and reach its goal on Kickstarter, as well as a further $62,874 through Indiegogo. However, despite the campaigns coming to a successful close around April, ahead of expected shipment in September, Motzfeldt recently told us that challengers with investors and design has led to a delay with Shft IQ. In order to accommodate those who have invested in the project, Shft has given backers the option to receive their previous product, the Shft One, though the future is currently unclear for IQ. Here's hoping the startup is able to get things back on track in 2018. When we first saw the idea for the Smart Buckle, we loved it. Being able to wear your treasured, traditional timepiece while replacing a redundant area of the watch with a smart component that could provide insights into your activity and sleep - that just made sense. And we weren't the only ones that thought so, with the team at Gooseberry raising $42,364 during a Kickstarter campaign for the Smart Buckle. Company co-founder Alexei Levene indicated to us that all orders have been now been shipped, with distribution partnerships also in place for 12 countries, and nine more planned for next year. We went through our Smart Buckle review earlier this month, and while we feel there's some room for improvement, we're looking forward to what this startup has planned for 2018. And, as Levene told us, it will be a year that debuts the next version of the Smart Buckle. Our smartwatches and fitness trackers are great at providing basic insights into our heart rate from the wrist, but the optical sensor on board is far from perfect - particularly during HIIT sessions. It's why Apple itself is reportedly looking to create an Apple Watch with an in-built ECG monitor, and what led startup HeartIn and founder Oleksii Vinogradov to create a range of smart clothing with the tech built in. After raising $18,137 through Kickstarter to bring the HeartIn garment to life, Vinogradov told us that all orders were shipped for the estimated delivery of November, despite post-funding challenges with firmware and clothing logistics. In the coming year, the startup will be looking to grow its reach and helping more people find accurate heart rate monitoring from the shirt, as well as working with health services in order to monitor outpatients. We'll be looking to try the tech out for ourselves in the new year, so stay tuned for our thoughts.